Springtime is luring us on the tracks with the first really warm rays of sunlight! 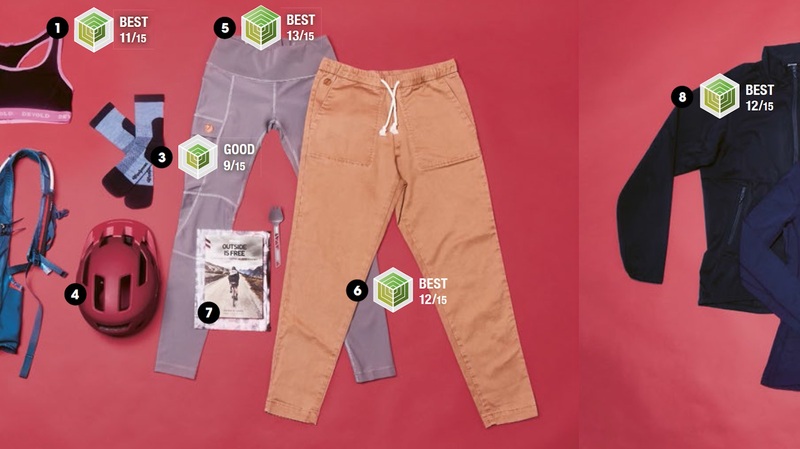 If you are wondering what to pack when cycling along the coast, mountain ranges, through the fields or while discovering a hip town, a look into NORR Magazine s Gear Guide will give you some inspiration. And with the help of GreenroomVoice you will get the full environmental lowdown! The Abisko Trail Tights are roduced in a factory in Lithuania that meets the social and environmental requirements of Fjällräven. The fabrics come from France and Switzerland G-1000 Air material is composed of 65% polyester, 35% organic cotton The fabric is PFC free and easy to repair and re-impregnate. Fjällräven has written own guidelines on responsible management in The Fjällräven Sustainability Compass, which can be downloaded from their website. They cooperate with I: CO (Collection System of discarded textiles) to feed into the recycling streams. BRAND COMMITMENT 5 out of 5 points- true best practice! Fjällräven does regular life cycle analyzes to achieve better environmental performances, they publish annual CO2 emissions reports and standardized environmental management reports according to GRI guidelines. They are also engaged and maintain memberships in relevant industry-related initiatives. 60-70% of the collection have a low chemical input and are mainly made of renewable raw materials or recycled material. The Fløyen Soft Shell is made of 95% recycled polyester and 5% spandex and manufactured by a long-time partner in Nicaragua who is Fair Trade certified. The material comes from neighbouring El Salvador from a factory, which has a strong social profile with extensive in-house health care and a green factory campus including waste management, energy and water monitoring and a social commitment beyond the facility (local school, infrastructure, reforestation, etc.). Bergans has a code of conduct according to the guidelines of the „Ethical Trading Initiative Norway“ and is a bluesign® system partner (which takes care of chemical and resource management). Bergans also holds an „Eco-Lighthouse“ certification for the headquarters. Bergans is working on a 2030 strategy continuously improving their environmental performance and strategically reduces CO2 emissions. They have a very close relationship with all manufacturers. 95% of the fabrics and materials are nominated (pre-selected), which means high degree of transparency. The products are designed for repairability: Repair service with local solutions of discarded products. You can find out more on Bergans‘ Brand Management and Brand Commitment here. Bergans has long-term partnerships in the supply chain, a strong control system in production and supports their partner to fullfil their „Code of Conduct“. They measure and improve the ecological Footprint of the products. Sustainability Reporting is done according to the guidelines the Ethical Trading Initiative Norway. These pants are made in a small family business in Portugal that is regularly visited by bleed staff personally. The fabrics and the yarn come from Spain, the organic cotton is from Africa and Turkey. So the pants are made from 100% cotton, which is partly from recycled cotton from Spain. Bleed compensates the CO2 emissions for transportation with Climate Partner from their warehouse to the customer, which is a huge step towards climate protection. Just imagine everyone doing that! !The packaging of the product was so far in recycled plastic bags, from 2019 onwards, bleed uses biodegradable plastic bags. bleed takes innovative responsibility in all business areas. Since the Supply chain is mainly in Europe, where their customers are, transportation emissions are kept fairly low. bleed shows strong social engagement in their region and support projects with PETA and Surfrider Foundation Europe. You can find out more about Bleed Organic Clothing on their GRV Brand Profile. 100% of the collection is made from more sustainable materials such as organic cotton, hemp, recycled polyester and cork. Thanks to a predominantly European supply chain, the social aspects are very well covered. bleed invests considerable into sustainable innovation. bleed takes old things back and has a repair service (communication via the social media), twice a year there is a repair café at the location in Helmbrechts /GER. The socks are made directly in Östersund / Sweden under the highest social and environmental standards and the name of the knitter from Östersund is attached to the product to make the relationship more personal and raise the awareness, that all clothing is still made by hand! The socks are made from 55% merino wool 43% polyamide 2% elastane. The mulesing-free wool comes from the Argentine part of Patagonia and Uruguay. Woolpower makes all their products in Sweden in their own factories! So no need to worry about social injustice. The raw wool is bought directly from the manufacturer, which gives control over quality and provenance. This is how Woolpower can perform a strict quality, environmental and chemical management. Woolpower has an own repair service, so don’t hesitate to send in your product, once it needs a little attention. Woolpower has begun to deal with the subject of Life Cycle Analysis in order to continually improve their environmental performance. There is a clear focus on wool products with the corresponding know-how. Material leftovers in production become products. Woolpower has a very high degree of transparency.